Luxurious and elegant, our 100% silk shell dress with stand collar and handy pockets is made exclusively in Japan using patented techniques. Golden flowers are specially arranged on a shimmering light blue background, calling to mind traditional Japanese kimono motif placement. Pair with kay me jackets for chic evening events. 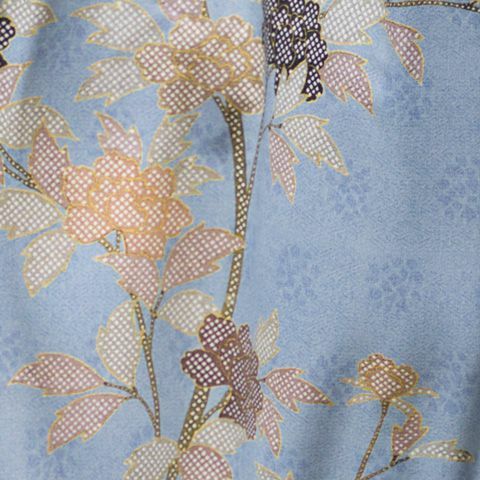 Pretty flowers flow effortlessly across the printed texture blue background of our stunning Hana Asagi dress. Our shell design creates a smooth silhouette, with hand-gathered bust, stand collar and handy pockets just the right size for small essentials.